Implement the latest best practices for industrial fire protection and fire safety with the most advanced edition of NFPA 68. Reflecting changes in technology, recent fire experience, and current fire safety practices, NFPA 68 Standard on Explosion Protection by Deflagration Venting applies to the design, location, installation, maintenance, and use of devices and systems that vent the combustion gases and pressures resulting from a deflagration within an enclosure so that structural and mechanical damage is minimized. This flexible Standard includes a performance-based option, including self-contained chapters supporting the performance-based aspect. New requirements are included to adjust the KSt values for certain metal dusts if the KSt value was obtained in a vessel smaller than 1 m3. An added equation helps you determine the hydraulic diameter for rectangular enclosures. A reorganized chapter on venting gas mixture and mist deflagrations clarifies the order and applicability of the various adjustments and corrections to required vent area. A new annex shows you how to implement the equations and calculation procedures, including partial volume effects. New requirements for determining Pmax, that replace requirements for determining KG, with revised equations for determining the turbulent flame enhancement factor. A reorganized chapter on venting dust and hybrid mixture deflagrations provides rules in the order they're applied in the field. A revised equation helps you determine vent area for elevated or subatmospheric pressure, with an example calculation added to the annex. Revised method of determining enclosure volume for dust collectors helps users calculate safe vent areas. Requirements for the use of plastic buckets in bucket elevators, previously in the annex, are now in the body of the Standard. 6.3 Enclosure Design and Support. 6.4 Enclosure Length-to-Diameter Ratio and Vent Variables. 6.6 Consequences of a Deflagration. 6.7 Effects of Vent Inertia. 6.8 Effects of Vent Discharge Ducts. 6.9 Venting with Flame Arresting and Particulate Retention. 7.2 Venting by Means of Low Inertia Vent Closures. 7.4 Effects of Panel Inertia. 7.5 Effects of Vent Ducts. 7.7 Deflagration Venting of Enclosures Interconnected with Pipelines. 8.2 Venting by Means of Low-Inertia Vent Closures. 8.3 Effects of Panel Inertia. 8.4 Effects of Partial Volume. 8.5 Effects of Vent Ducts. 8.6 Bins, Hoppers, and Silos. 8.7 Venting of Dust Collectors Using Bags, Filters, or Cartridges. 8.10 Venting Internal to a Building with Flame-Arresting and Particulate Retention Device. 8.11 Venting Silos or Other Storage Vessel Provided with Integral Bin Vents. 8.12 Deflagration Venting of Enclosures Interconnected with Pipelines. 9.3 Multiple Deflagration Vents on a Pipe or Duct. 10.3 Types of Building or Room Vent Closures. 10.4 Restraints for Large Panels. 11.2 Design Parameters and Documentation. 11.5 Procedures Following Vent Closure Actuation. 11.6 Vent Closure Design Parameters. NFPA 68 includes the new best practices for Industrial fire protection and fire safety. Updated based on technology changes, fire experience, and the latest fire safety practices, NFPA 68 Standard on Explosion Protection by Deflagration Venting applies to the design, location, installation, maintenance, and use of devices and systems that vent the combustion gases and pressures resulting from a deflagration within an enclosure so that structural and mechanical damage is minimized. The Standard includes a performance-based option, including self-contained chapters supporting the performance-based aspect. 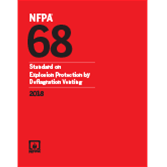 Interested in other editions of NFPA 68? Use the drop down menu above to select the edition year you need.